If you are interested in photographing the night sky including capturing stars, star trails, the Milky Way, meteors and timelapses please join us on one of our workshops, field expeditions or webinars. Workshops are generally multi-day/night events with classroom instruction to help you get the most out of the photographs you capture. Field Events are partial day or Night events where the goal is to capture compelling images on site at some of the most fascinating places we know. Webinars are generally held on weeknights while Field Expeditions and Workshops may be conducted at any time when the celestial conditions permit them. Alabama Hills, near Lone Pine, California. Sometimes we have a meteor party here! 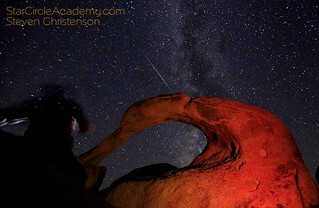 Two or three nights chasing the Milky Way, Star Trails, Perseid Meteors and amazing landscapes. The nearest town is Lone Pine, California. Indeed, it is very conveniently close. We recommend that you book a room in the Dow Villa which will be our base of operations. 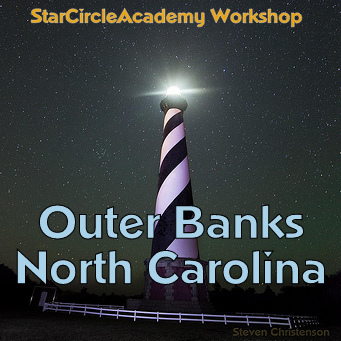 Mention "StarCircleAcademy" when you book! Lodging not included. 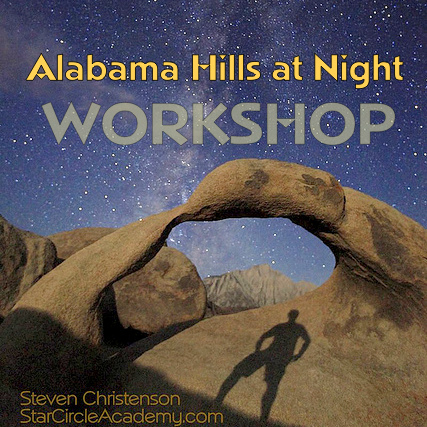 This event starts the Saturday before Easter Sunday and includes instruction and location shooting of sunrises, sunsets, wildlife, star, star trail, time lapse and Milky Way photography. 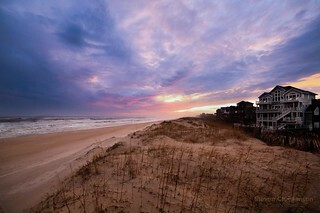 Also includes oceanfront accommodations, professionally prepared meals AND plenty of instructions on photography, photo processing, and more. You'll have free time, too. We will visit historic and picturesque locations like Hatteras Lighthouse, the Bodie Lighthouse and it's adjacent wildlife sanctuary. The towering dunes of Jockey's Ridge, as well as Kitty Hawk and Kill Devil Hils (where the Wright Brothers made their first flights). We'll take a ferry to Ocracroke Island where we can visit truly huge unspoilt stretches of beach, try our hand at the Ocracroke Lighthouse at night and take unusual images from aboard the ferry as it heads back at night. During your free time you can arrange to hang glide at Jockey's Ridge, race go carts at Rodanthe, take an aerial tour of the Outer Banks, play golf at an area course or opt for a sport fishing excursion. Unwind and let the awesomeness of the place unkink and relax you. The amount shown below is the full payment option. Please see our Cancellation and Refund policy. The quantity listed are the number of rooms remaining. NP105 Creating Star Trails – how to shoot and process star trail images. I would be interested in a beginning course in night photography. 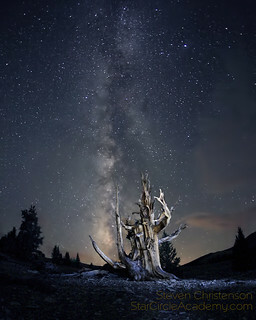 I live in Mammoth Lakes, CA and we could do it up here and use my house as a base and place to stay. There are many wonderful places up here that are just as good as the rock in Yosemite; I would say better, but I’m prejudiced. I photograph birds, and know nothing about the night except that I like it. Thanks for your interest, Donna. We do organize workshops all over. Our recent ones were in Alabama Hills (Lone Pine, CA) and at White Mountain (east of Bishop, CA). If you’re looking for some tips to get you started in night photography, you may find our “Introduction to Night Photography” Webinar to be a good fit. We don’t run it very often though – about twice a year. Clear skies and best of luck! I would be interested in a workshop in Death Valley or the surrounding area in the next couple months. Thanks, Dave. We don’t have a workshop scheduled for that area* You might check with Jim Patterson and see if he has a cancellation in his November workshop. Or wait until February. I can vouch for Jim – great guy, great photographer. Tell him I sent you. 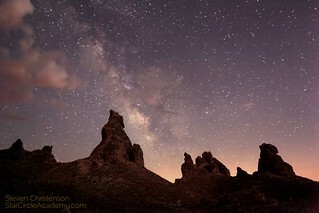 *I did schedule and conduct an outing at Trona for the 2012 Geminid Meteor shower.